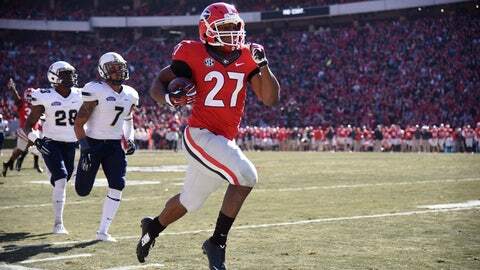 Nick Chubb's Georgia Bulldogs have a true fan in rapper Pastor Troy. The Georgia Bulldogs are aspiring to win an SEC Championship this year. Mark Richt’s program hasn’t won a conference crown since 2005. Any and all help in the winning category would be beneficial. One very famous Georgia fan can teach Richt’s team a thing or two about bringing home some championship hardware. Prior to today’s season opener versus ULM, rapper Pastor Troy was patrolling the sidelines with his glorious personalized championship belt. As one could see, Pastor Troy was hyped about watching the Bulldogs live. Maybe Nick Chubb can try it on?